During her stay in Bombay (now Mumbai) from the year 1942 onwards, young Geeta Dutt came in touch with several non-Bengali families and was quick to learn different languages through the association and acquired working knowledge of Hindi, Punjabi, Nepali, Sindhi, Urdu, Gujrati, Marathi and others and this proved to be useful in later years. After her debut in Hindi film music in the year 1946, Geeta started gaining popularity in a short period of time. 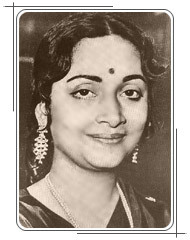 The very next year she became the most sensational voice with the success of songs from Do Bhai(1947). This led to the composers from the Gujrati film industry approach her for singing in Gujrati films. Avinash Vyas was one of the most prolific and talented composers from Gujrati film music. He was already working with Geeta Dutt for his Hindi films and thus Geeta became a natural choice for singing in his Gujrati film songs right from the year 1948. A detailed discussion on her work in Gujrati film and non-film music is here..
Bengali being the mother tongue of Geeta, it was obvious to see Geeta Dutt singing songs in Bengali. It is a kind of surprising that after a few assignments in early fifties, Geeta did not sing much in Bengali for several years. Sachin Dev Burman gave Geeta her first opportunity to sing in a Bengali film Samar (1950), the song was Khela Bhangar Khela. She also sang a duet with Kishore Kumar for this film.Samar was based on Bankimchandra Chattopadhyay's novel and the film was made in Bombay. 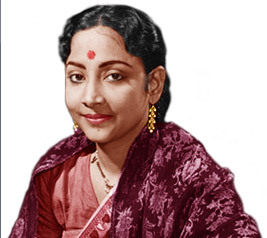 From mid-fifties, Geeta Dutt was a regular feature in Bengali film music. She also sang a sizeable number of "Aadhunic Gaan" (Modern songs or Contemporary songs). A detailed discussion on her work in Bengali film and non-film music is here.. 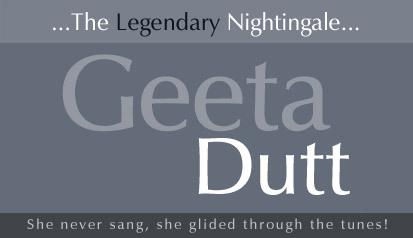 Even though Geeta lived for almost thirty years in Bombay (now Mumbai), she did not get to sing a lot of Marathi songs. Very little information is availble as to why she did not get/choose to sing more than a handful of songs in Marathi. It is a fact that Marathi was the mother tongue of Lata ji,Asha ji and Sulochana Kadam (who later became the famous "Lavani" singer Sulochana Chavan). Probably reaching to their diction and command on Marathi was a tall order for Geeta Dutt. Surprisingly, the upcoming Suman Hemadi (who later became Suman Kalyanpur), who hailed from Bengal, the same state as Geeta Dutt, managed to carve a niche in Marathi film and non-film music scenne. A discussion on her work in Marathi film and non-film music is here..
Bhojpuri is one of the popular language of North India. The veteran composer S.N. Tripathi ji composed music for many early films in Bhojpuri. Geeta Dutt got a chance to sing some songs in Bhojpuri under his direction. She also sang songs in Nepali, Maithili,Punjabi and many more languages. A detailed discussion on her work in other languages in films and non-film music is here..